Hiring? Toptal handpicks top API developers to suit your needs. So, what’s the big deal with this new Vulkan API anyway, and why should we care? Here’s the Vulkan API in a hundred words or less: It’s a low-overhead, close-to-metal API for 3D graphics and compute applications. Vulkan is basically a follow-on to OpenGL. It was originally referred to as the “next generation OpenGL initiative,” and it includes a few bits and pieces from AMD’s Mantle API. Vulkan is supposed to provide numerous advantages over other GPU APIs, enabling superior cross-platform support, better support for multithreaded processors, lower CPU load, and a pinch of OS agnosticism. It should also make driver development easier, and allow the pre-compilation of drivers, including the use of shaders written in various languages. 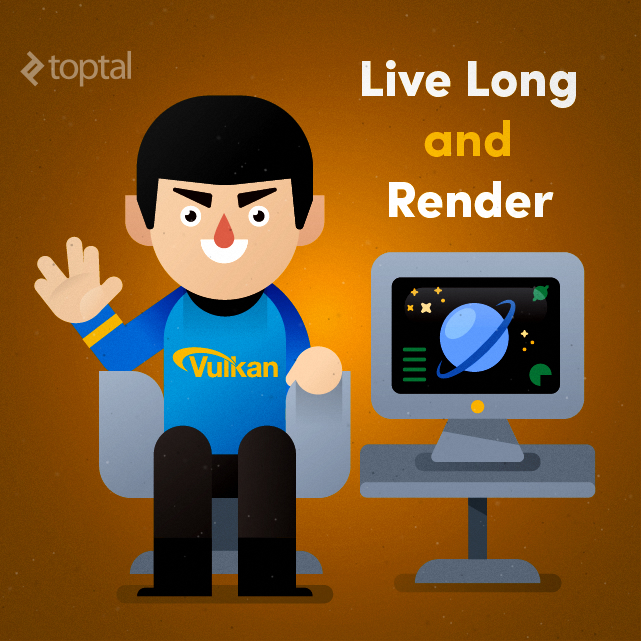 Meet the new Vulkan API: Live Long And Render! That’s 93 words, so if you’re not interested, you can skip the next 3,500. If, on the other hand, you want to know more about the upcoming graphics API that will be with us for years to come, I’ll get started on the basics. 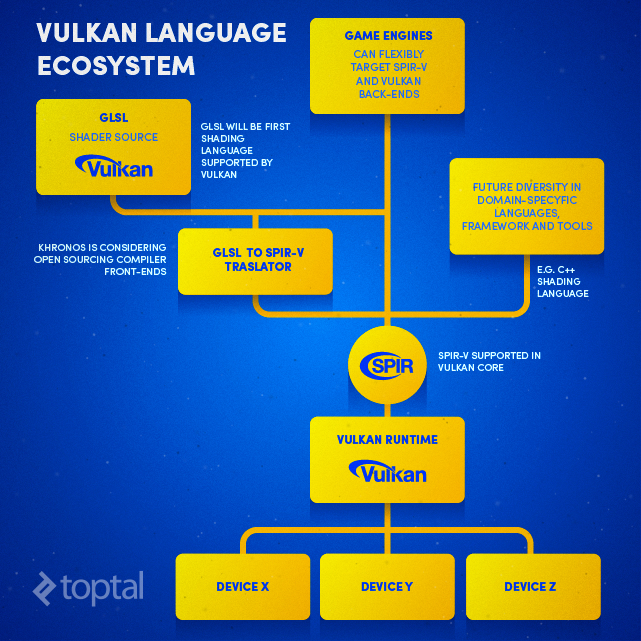 Vulkan was originally announced by the Khronos Group in March 2015, with a tentative launch date set for late 2015. In case you are not familiar with Khronos, it’s a non-profit industry consortium founded fifteen years ago by some of the biggest names in the graphics industry, including ATI (now a part of AMD), Nvidia, Intel, Silicon Graphics, Discrete, and Sun Microsystems. Even if you haven’t heard of Khronos, you’ve probably heard of some of their standards, such as: OpenGL, OpenGL ES, WebGL, OpenCL, SPIR, SYCL, WebCL, OpenVX, EGL, OpenMAX, OpenVG, OpenSL ES, StreamInput, COLLADA, and glTF. By now, you’re probably thinking “Ah, it’s those guys,” so I can skip the rest of the intro and focus on the API itself. Unlike its predecessor, or predecessors, Vulkan is designed from the ground up to run on diverse platforms, ranging from mobiles and tablets, to gaming consoles and high-end desktops. The underlying design of the API is layered, or should we say modular, so it enables the creation of a common, yet extensible architecture for code validation, debugging, and profiling, without impacting performance. Krhonos claims the layered approach will deliver a lot more flexibility, catalyse strong innovation in cross-vendor GPU tools, and provide more direct GPU control demanded by sophisticated game engines. Now, I understand that a lot of technophiles have their reservations about marketing terms like “flexible,” “extensible,” and “modular,” but this time around we are dealing with the real McCoy. As a matter of fact, that’s the basic idea behind Vulkan: It’s envisioned as an API for the masses, from kids gaming on smartphones, to their parents designing buildings and games on workstations. In theory, Vulkan could be used in parallel computing hardware, to control tens of billions of GPU cores, in tiny wearables and toy drones, in 3D printers, cars, VR kit, and just about anything else with a compatible GPU inside. For more details, I suggest you take a look at the official Vulkan overview in PDF. If the close-to-metal approach sounds eerily familiar, you may have been following AMD’s GPU announcements over the past two years or so. AMD surprised industry observers when it announced its Mantle API in 2013, and it surprised them once again when it decided to pull the plug on the API, announcing in March 2015 that it would not release Mantle 1.0 as a public SDK. In a nutshell, Mantle promised to deliver significant performance and efficiency improvements in some situations, especially on the CPU front since it would reduce processing overhead. It sounded like a good idea, as gamers could put together custom PCs with somewhat slower processors and invest more money in top notch graphics cards. It sounded very convenient for AMD, too, because the company hasn’t had a competitive high-end CPU in years, although it still has good GPU products. As weeping AMD fanboys gathered to mourn the passing of their saviour, Mantle was miraculously resurrected. The good news came in the form of a blog post, penned by AMD VP of Visual and Perceptual Computing, Raja Koduri. Coincidentally, in keeping with the religious theme, on one occasion Koduri held a sermon on a mount, during AMD’s Hawaii launch event in 2013, but I digress. Joking aside, Koduri’s team did a good job. While Mantle didn’t become a new industry standard, it did become a foundation for Vulkan. The biggest difference is that Vulkan will not be restricted to AMD GCN hardware; it will work on a lot more GPUs from different vendors. You can probably see where I am going with this; it’s a bit better to have a single low-overhead graphics API that works on different operating systems and hardware platforms than to have proprietary APIs for different GPU architectures, OSes and so on. It sounds like a pun, but AMD's Mantle is actually at the core of the new Vulkan API. Vulkan API simply takes a good chunk of the Mantle pie and shares it with everyone, regardless of OS, hardware, race or religion. Oh, and there’s one more thing: Mantle eventually forced Microsoft and Khronos finally to do something about DirectX and OpenGL bloat and inefficiency. It was a gentle, friendly kick in the posterior, or “badonkadonk,” as one fellow Toptaler likes to put it. How Does Vulkan Compare To OpenGL? Obviously, I need to outline the basic differences between Vulkan and OpenGL. Khronos came up with a simple illustration, showing how much driver bloat could be eliminated with the new API. Vulkan is a unified API for all platforms, and it enables simpler drivers as well. Vulkan allows applications to get closer to metal, thus eliminating the need for a lot of memory and error management, as well as a lot of shading language source. Drivers will be lighter, leaner and meaner. Vulkan will only rely on the SPIR-V intermediate language, and since it has a unified API for mobile, desktop and console markets, it should also get more tender, loving care from developers. But wait, doesn’t this simply offload more work to game developers? Sure, they will be able to use hardware more efficiently, but what about their own man-hours? This is where the layered ecosystem approach enters the fray. Developers will be able to choose three different levels, or tiers, of the Vulkan ecosystem. Use Vulkan directly for maximum flexibility and control. Use Vulkan libraries and layers to speed up development. Use Vulkan via off-the-shelf game engines fully optimised over the new API. The first option clearly won’t be for everyone, but I suspect it would make for some nice benchmarking software. Khronos expects the second option to be a “rich area for innovation” because many utilities and layers will be in open source, and will ease transition from OpenGL. If a publisher has some OpenGL titles that need tweaking and updating, this is what they would use. The last option is, perhaps, the most tempting one because the heavy lifting has been done by industry heavyweights such as Unity, Oxide, Blizzard, Epic, EA, Valve and others. Originally created for graphics workstations with direct renderers, split memory. A better match for modern platforms, including mobile platforms with unified memory and tiled rendering support. Driver handles state validation, dependency tracking, error checking. This may limit and randomise performance. The application has direct and predictable control over the GPU via an explicit API. Obsolete threading model does not allow generation of graphics commands in parallel to command execution. API designed for multi-core, multi-thread platforms. Multiple command buffers can be created in parallel. API choices can be complex, syntax evolved over twenty years. Removal of legacy requirements simplifies API design, simplifies usage guidance, reduces specification size. Shader language compiler is a part of the driver, and it only supports GLSL. The shader source has to be shipped. SPIR-V is the new compiler target, enabling front-end language flexibility and reliability. Developers have to take into account implementation variability between vendors. Due to the simpler API and common language front-ends, more rigorous testing will increase cross-vendor compatibility. To be honest, I don’t think it is even fair to compare the two. Vulkan is a Mantle derivative, while OpenGL is a mastodon with 20 years’ worth of baggage. Vulkan is supposed to ditch loads of legacy stuff; that’s the whole point. Vulkan is supposed to streamline testing and implementation, make drivers leaner, and improve shader program portability via the SPIR-V intermediate language. This brings us to the next question. What does Vulkan really mean for developers? So where does SPIR-V come into play, and what happens to good old GLSL? GSLS will stay alive for now, and it will be the first shading language supported by Vulkan. A GLSL to SPIR-V translator will do the heavy lifting, and voila!, you’ll get SPIR-V ready to feed the hungry Vulkan runtime. Game developers will be able to use SPIR-V and Vulkan back-ends, probably relying on open-sourced compiler front-ends. In addition to GLSL, Vulkan can support OpenCL C kernels, while work on adding support for C++ is progressing. Future domain-specific languages, frameworks and tools are another option. Khronos even mentions the possibility of developing new experimental languages. The SPIR-V language is the glue that will bind different platforms in Vulkan API. 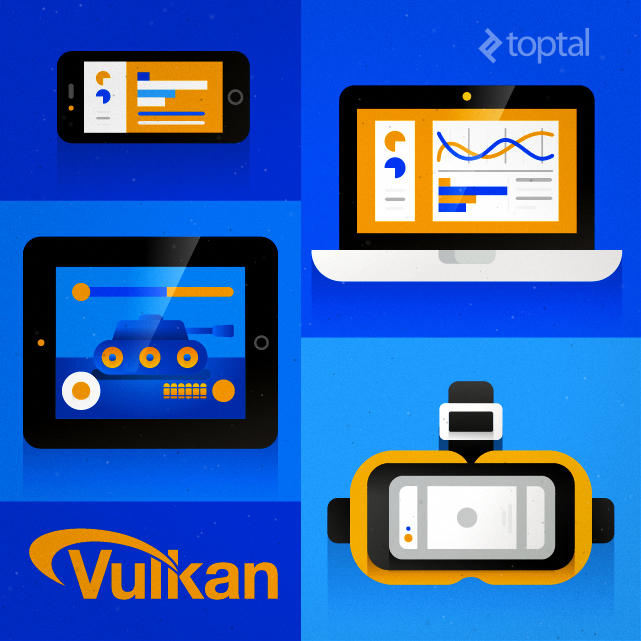 Whatever developers choose to do, all roads lead to Vulkan, via SPIR-V, and then to a multitude of different devices. Since there will be no need for every hardware platform to feature a high-level language translator, developers will deal with less of them. An individual ISV can generate SPIR-V using a single tool set, thus eliminating portability issues of the high-level language. SPIR-V is simpler than a typical high-level language, making implementation and processing easier. Khronos does not specify any performance numbers and notes that “mileage will definitely vary.” It will all depend on how Vulkan is used. If you want to check out the gritty details, be sure to check out the SPIR-V white paper. I have outlined a number of features that should make Vulkan and SPIR-V popular in the dev community, and Khronos is keen to get this point across as well. The prospect of using the same tools and skills to develop for multiple platforms appears intriguing, especially now that the performance gap between various platforms is closing. Of course, developing a big-budget AAA game for PCs will remain an extremely complex and time-consuming process, involving heaps of cash and human resources, but mobile platforms and integrated GPUs employed in the latest Intel and AMD processors already deliver a lot of GPU performance for the casual gamer. Besides, small, independent developers, or freelancers, are more likely to work on cross-platform casual games than AAA titles churned out by major publishers. I am sure you’ll agree that this sounds good, but there is still a long way to go. As I said, Vulkan is still pretty much a work in progress, and we should have the full spec by the end of the year. However, from what we have seen so far, the new API can unlock a lot of performance even with current-generation hardware. The best illustration of Vulkan I’ve seen so far comes from Imagination Technologies, one of the leading mobile GPU outfits out there. Imagination Technologies GPU IP is used in all iOS gadgets, along with numerous other ARM-based System-on-Chip designs, and even in some low-voltage Intel x86 chips. Last week Imagination published a blog post detailing the performance gains made possible by Vulkan. Its choice of hardware was somewhat unusual: a Google Nexus Player, based on a rarely used Intel quad-core processor with PowerVR G6430 GPU. The device was tested with the latest Vulkan API driver for PowerVR GPUs, while the reference run was performed on OpenGL ES 3.0. The performance gap was nothing short of staggering. The scene includes a total of 400,000 objects, with different levels of detail, ranging from 13,000 to 300 vertices. 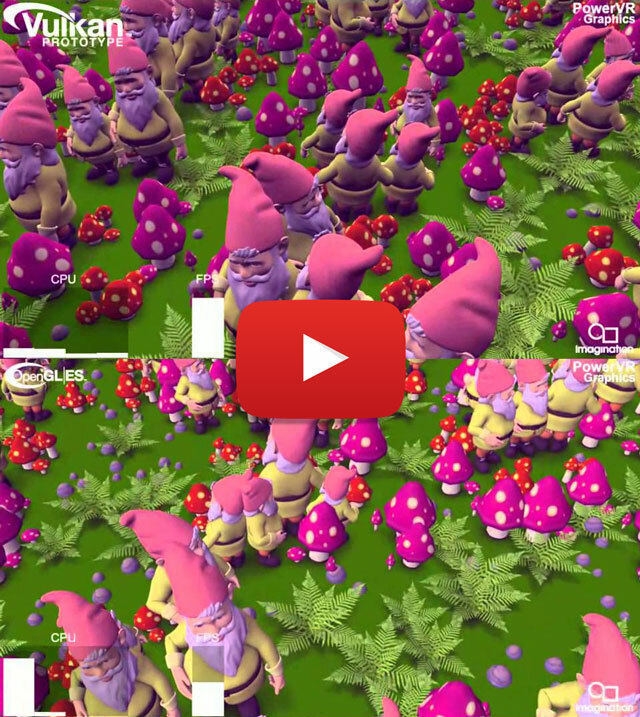 The wide shot shows an estimated one million triangles, some alpha on the plants and about ten different textures for the gnomes and plants. Each object type uses a different shader and the gnomes are not instanced, each draw call could be an entirely different object, with different materials, but the end-result would be similar. Still, there’s a big caveat: This is not the sort of performance boost you can expect in real life. The Imagination Technologies team used an exaggerated scenario to highlight Vulkan’s superiority, to push it to its limits, and in this particular scenario the limit is in favour of Vulkan vs. OpenGL ES. Also, keep in mind that this test is GPU-bound, but it is still a good illustration of Vulkan’s superior CPU utilisation. How Does Vulkan Reduce CPU Utilisation? Remember that OpenGL vs. Vulkan table we had earlier, or to be more specific, that tiled rendering bit? Probably not, so here it is, in a nutshell: Imagination used Vulkan to batch draw calls into tiles and render a tile at a time. Depending on where the tile is at the moment the frame is rendered, it can come into or go out of view, change its level of detail, and so on. In OpenGL ES, all draw calls are dynamic, they are submitted with each frame, according to what is in the field of view. Draw calls that have already been executed cannot be cached. As a result, OpenGL ES needs many calls into kernel mode to change the state of the driver and validate it. Vulkan does not because it relies on pre-generated commands (command buffers) to reduce CPU overhead and eliminate the need to validate or compile during the render loop. The Imagination team described the ability to re-use command buffers as “useful in some circumstances,” and possible to use “to a great extent” in many games and applications. The second game changer is parallel buffer generation, which enables Vulkan to harness the power of all CPU cores. OpenGL ES was designed before the advent of multi-core mobile chips, but over the past three years, the industry has gone from two, through four, to eight and ten CPU cores, with Apple’s A-series SoCs and Denver-based Nvidia Tegra chips as the only notable exceptions. I talked about mobile SoC trends in one of my previous blog pieces, covering the upcoming Optimizing Android compiler, so you can check it out for additional info. Let’s try an analogy: If Vulkan was an internal combustion engine, it would be storing and reusing part of its power, in much the same way a turbocharger and intercooler would (command buffers), and it would be able to use four, six, eight or even ten cylinders with no loss in efficiency (parallel buffer generation). Comparing Vulkan to OpenGL ES sounds a bit like comparing a new, downsized turbo engine to an old, single-cylinder engine on your granddad’s Triumph Trophy. Well, at least granddad was a proper rocker, not a mod. The end result is a vastly more efficient environment, capable of putting all available hardware to good use, unlike OpenGL ES, which is CPU bound in most scenarios. This means Vulkan can deliver similar levels of performance while keeping the CPU at lower clocks, thus reducing power consumption and throttling. If a developer wants to implement some of the neat features outlined in this post, it will involve a fair amount of work. Each will have to be implemented in code, but the good news is that industry leaders will make the process easier with new driver updates. There aren't that many downsides to the Vulkan API, but it will take a while before we see it in action. 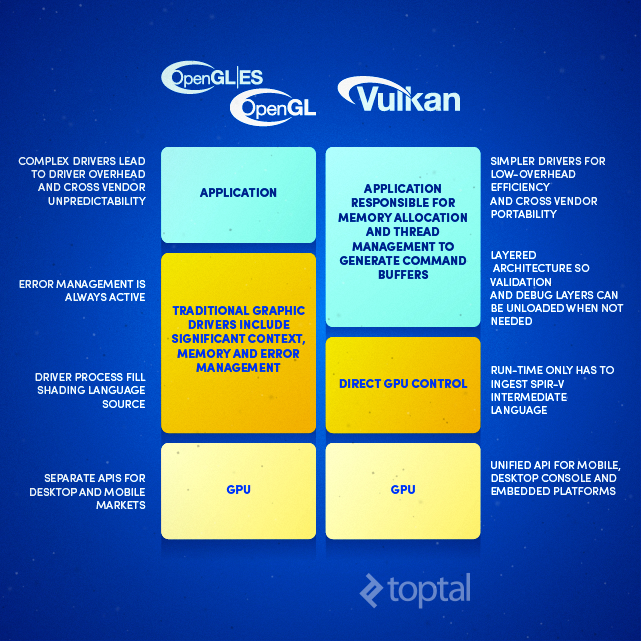 Time-to-market is another concern, as is the implementation of Vulkan in older apps and games. Vulkan is still a technical preview; initial specifications and implementations are expected by the end of 2015, so, realistically, we probably won’t see many real-world applications before mid-2016. Industry support should not be an issue; After all, this is a Khronos standard, but it may take a while. That’s one of the reasons I focused this post on the mobile segment; Mobile software and hardware evolve more quickly, and it may take a few more quarters before we see Vulkan making an impact on desktop platforms. That’s just how the industry works, there is a lot more stuff to worry about in the desktop niche: support for professional applications, hordes of pitchfork-wielding gamers going ape over every torn frame, and so on. However, the fact that Vulkan is derived from AMD’s Mantle is encouraging. While Vulkan can do wonders in a CPU-bound setting, especially with multi-core mobile SoCs, these performance gains will be limited on desktop platforms. Desktops handle multi-core processors with a greater level of efficiency, and most graphically demanding applications are GPU-bound. Until all pieces of the puzzle fall into place, some developers may be reluctant to take the plunge and mess around with Vulkan. A lot of people simply don’t have time to experiment, and they learn new skills only when absolutely necessary. Burning a lot of money and wasting man-hours to tweak existing mobile games to use Vulkan at this early stage won’t be an option for many developers and publishers. Compatibility with older hardware could be another source of concern. Vulkan will need OpenGL ES 3.1 or OpenGL 4.1 hardware, accompanied by new drivers. For example, Imagination Technologies’ PowerVR series 6 GPUs can support it, but series 5 cannot. Qualcomm’s Adreno 400 series supports OpenGL ES 3.1, but the 300 series does not. ARM’s Mali T600- and T700-series support OpenGL ES 3.1, but support is lacking on older T400-series designs. Luckily, by the time Vulkan becomes relevant, most devices with unsupported GPUs will be out of the picture. These include the iPhone 5/5C, fourth generation iPad and Samsung devices based on certain 5000-series Exynos chips. Qualcomm-based devices may not be as lucky since Adreno 300-series GPUs are used on relatively recent and prolific designs such as the Snapdragon 410, Snapdragon 600, Snapdragon 800 and 801. However, I suspect most of them will be gone by the time Vulkan becomes truly relevant. It is still too early to say whether or not Vulkan will be a game-changer, but I think you will agree that it has plenty of potential. I think it will be a big deal, and I base that assumption on a decade of experience covering the GPU industry. It will take time, however, and I suspect Vulkan will make its presence felt in mobile before it starts changing the desktop landscape. At about the same time Vulkan-optimised drivers, game engines, and games, we will get new hardware to play around with, and I don’t mean just minor hardware tweaks. Mobile SoC development has stalled for a number of reasons I won’t go into now, but 2016 will be a big year for the industry, as 14/16nm FinFET nodes become available to more manufacturers, and become economically viable for mainstream hardware rather than flagship chips. Developers will have vastly more powerful and efficient hardware to play around with, and a new low-overhead graphics API will be the icing on the cake. I sincerely hope hardware vendors will stop using display resolution as a marketing gimmick, as pointlessly high resolutions do nothing for visual quality but still waste power. Unfortunately, since the average consumer doesn’t get this, and wants to see bigger numbers on the box, I suspect this won’t happen anytime soon. I intend to examine this weird issue in one of my upcoming posts, so if you’re annoyed by it, stay tuned and feel free to vent in the comment section. Yep, plenty of potential. One more downside. It’s not ready yet (neither specification nor drivers), you can’t get one, and no one knows if/when you’ll be able to. While on PC platform, functionally equivalent DirectX 12 API is already on the market (and open beta is here for 10 months already). And on Apple’s OSX and iOS platforms, functionally equivalent Metal API is available for 2 months on the market. would you recommend to learn directly Vulkan (instead of learning openGL) for a developer who wants to start developing for GPUs? Just thought I'd point it out really quick: The "tiled renderer support" bit in your Vulkan table has nothing to do with how the Imagination guys implemented their demo. A "tiled renderer" is a GPU that has a small, but very high speed buffer into which it renders. Because this buffer is a lot smaller than the overall framebuffer that a graphics application normally renders to, it has to divide up the big framebuffer into logical "tiles", and render each of them separately (ie. render tile, then store the pixels from the tile buffer back into the framebuffer living in slower memory"). To accommodate such GPU architectures, a graphics API needs to be explicit about whether to fetch existing data from the slow framebuffer, and whether to store back or discard the contents of the tile buffer after rendering (which unlike OpenGL, Vulkan and Metal do). You will find these almost exclusively in mobile chips (same with unified memory model, where CPU and GPU share the same memory). Once Vulkan drivers are in existence, there's no point in using OpenGL at all, so you're going to have to learn Vulkan anyway. Except for DirectX12 API being proprietary, controlled by MS and locked at Windows 10, and Metal seriously lacking features comparing to OpenGL, also being locked on one particular platform. Compare this to API supported by all vendors - both engine and card ones - and being supported on Windows 7, 8, 10, Linux, Android, Tizen, with Nintendo next console and PS4 hinted as supporting it at one point. People using DirectX12 as something already released should pay attention. If you want to develop engine, Vulkan and DirectX12 should be way to start it, as it is clearly way to do it now. If you want to design things, choosing already existing engine would be better. This is so wrong. There is no point in using Vulkan if your application is not CPU bound. In this case you gain no performance and blow up your code complexity and just waste your time. OpenGL will be around quite a long time and there is nothing wrong about it to learn. I use OpenGL and will be happy to learn Vulkan and use them for the right purpose. If i need to visualize a 3D model with just a few hundred polys and draw calls it would be very stupid to waste my time in writing this with Vulkan. Use the right tool for the job and don't act like "if you have a hammer everything looks like a nail" ... Vulkan is not the answer to everything! Actually if you want to be a good graphics programmer you should consider learning OpenGL just to know what Vulkan does better ... its like "should i learn assembler or c or c++?" the question here is: "for what purpose?" if you want to program in c++ than learn c++ but it doesn't hurt to know c or assembler, actually you will be a better programmer if you know all of them. So if one ask "should i learn XY" you should ask: "are you planning to use XY" if the answer is "no" than learn it not if its "yes" than yes but if you're planning to be an overall better programmer (or what ever topic) than learning NEVER hurts. There's no point in writing an OpenGL engine when Vulkan exists whether you are CPU bound or not. Not everyone is using a 4 GHz processor, and lots of us like to keep our CPU consumption as low as possible. However, there's more to Vulkan than reduced overhead. It's also easier to write directly to the metal than you could using an abstraction layer like OpenGL. It's even easier to write and maintain graphics drivers for Vulkan as well. Vulkan does the exact same thing that OpenGL does, only does it better. Comparing the two is like comparing a wooden hammer to a steel hammer. "Not ready yet" isn't a huge deal, and just a temporary downside. The same thing could be said for anything developed in the past. It’s complex and expensive project to design such an API, implement drivers for the variety of the hardware on the market, and convince developers to use that new API. Let me remind you about the revolutionary OpenGL 3.0 codename “Longs Peak” the very same Khronos Group has failed to deliver. It’s functionally equivalent in a sense that it provides multithreaded access to GPU with minimal CPU overhead. Yes, Metal miss important features compared to OpenGL or DirectX 9-11. This is by design. Video drivers previously implemented those features. Now you can implement them yourself on top of the new API. Alternatively, you can wait for game engine developers to implement them for you. BTW, if Kronos group will deliver their Vulkan API, it will apply to Vulkan as well. All DirectX versions are proprietary, controlled by MS and locked at Windows. The industry does not care. Just because an API is available on all platforms does not make it a good one. OpenGL is supported by all vendors, both engine and card ones, Windows 7, 8, 10, Linux, Android and OSX. Regardless on that, 99% of games running on Windows render using Direct3D. Even the very same games that render with OpenGL in their OSX and Linux versions, like World of Warcraft, or Valve games. Then let me remind you that Khronos has been working on the spec in direct conjunction with a few major game studios like Valve for the first time. The situation is different; I feel that it's actually being led properly this time. Do you really think the same mistake will be made twice? And that event in the past is the evidence that they could not deliver a decent release this time? Sry but i expect shortly after the final release spec the delivery of working drivers. All major GPU players have working drivers now cuz there are involved in the spec process. We already saw them demonstrating demos to no surprise cuz a roughly coded userspace part of Vulkan only takes 40K loc. its not as expensive as you wanna make this. Its not that the GPU manufactures start coding the driver as soon as the Vulkan specs are officially released. The drivers are partly ready(as the manufactures saying themselves) and getting improved as the spec are for now. We know nothing about how fast or slow the specification changes. Have you ever developed anything sufficiently complex in an undermanaged project where requirements changed often? I did once, and from my experience, such projects do not always deliver anything good. Also, there’s a lot of work from showing a demo in the controlled environment to having stable and performant drivers for at least 2-3 recent GPU generations * 3.5 major platforms (Android, Windows 64 & 32, OSX 64). No i have not (Knock on wood) but i can see your point here and can understand your concerns regarding this. Maybe its just me, but "this" time i see a different approach as it seems – as i said maybe just me – more parties are involved that matters and companies spend money and effort for building tools etc. For what i can say is, that i am really impressed how incredibly fast Khronos is evolving Vulkan and espessially SPIR-V. As i first read about Vulkan i was just like "Oh Boy, cool you try but i guess we'll have anything working in like 5-8 years ... i hope i don't forget about Vulkan in the meantime" ... but i was corrected. You have to admit, that its really fast moving currently – even if its taking another year or so as you claiming. EDIT: as for now i see no working Vulkan driver on OSX side. I guess Apple is trying to establish a second "D3D" for a vendor lock in with Metal and thus do not implement a Vulkan driver and soon abandon the development of their OpenGL driver that already lacks like 5 years behind the current standard. "If a developer wants to implement some of the neat features outlined in this post, it will involve a fair amount of work. Each will have to be implemented in code, but the good news is that industry leaders will make the process easier with new driver updates." Isn't that a bad thing? What's the point on depending less on drivers for programming something if you ask to depend on drivers anyway? what you said is a bit misinformation. Khronos and Nvidia have stated that Vulkan, while having multithreaded access to gpu with minimal cpu overhead, will also include the features offered by opengl 4.5 (and subsequently DX11 as well, due to them being more so matched in features). DX12 is also like this, in that it offers features from prior DX versions (tessellation, geometry shaders). Features from mantle will naturally be included as well, given what vulkan is. The most important thing to learn is not the API but what the hardware does with the commands that the api sends to the driver and onto the hardware. Having a good handle on memory access, synchronisation, gpu threads, ROP etc will help explain any graphics api. The thing about Vulkan, and other similar Apis (mantel, metal), is they're really compute platforms. Open GL was born as a graphics platform and in recent years compute has been slotted in on top. Vulkan is designed to be a compute platform and one of the things we do with that compute power is graphics operations. The big catalyst in all of this is new generation architectures, in particular the exposure of shared memory. Vulkan provides much more control over how memory can be used, but choosing the best memory for any given construct requires decisions on what memory regions are available. To get the best out of Vulkan you would benefit from knowing what the hardware actually does, this is not as important with OpenGL (though still important), but for anyone who's sat profiling an Open GL application thinking "how can I get these draw calls down" or "how can I reduce my state changes and driver overhead", then you will understand why Vulkan is going to be a game changer. Open GL is not going to disappear any time soon though. It will continue to be supported, vendor extensions will continue to appear as hardware improves. Some applications, such as simple games don't really need Vulkans power, but large scale complexed visualisations and AAA gaming certainly will. Back to the original question, learn OpenGL, comfortable with the hardware, then learn Vulkan,DX12,Metal, Mantle. Learn it all. They will have an OpenGL-like module for Vulkan. Learning an old graphics API after a brand new one comes out seems like a dumb idea to me. Who cares if it's more complicated, not everybody feels the need to use the easiest route possible just to save time. I just want to play games on a normal functioning PC.